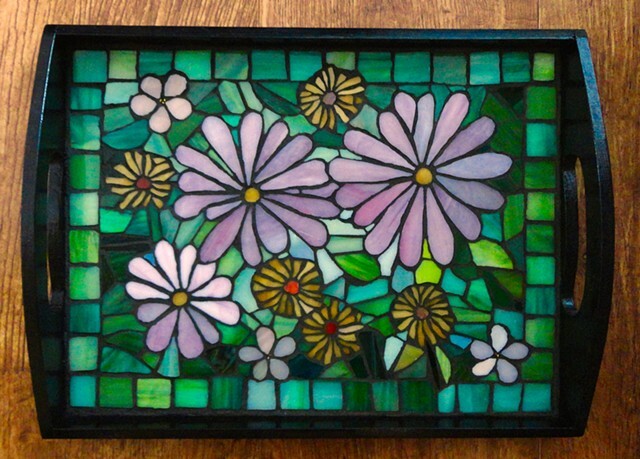 This stained glass tea tray was named for the colour of the flowers which reminded me of glasses of chilled pink lemonade in the summer. I love my own mosaic tea tray (a stylized Celtic knot) and others who have mosaic trays like them too; the artwork brings the serving piece to a beautiful and classy level. Sold. Commissions for tea trays available. Please contact us for information.